Meteorite classification systems exist for one purpose - to help establish a baseline of order from a collective of unknowns. Research enables us to group different rocks and chunks of iron into neat little piles of similar nature. Deciphering the record preserved in each of these groupings helps us to understand their origins, and perhaps, ours. But sometimes they are not so neat. Sometimes we simply cannot understand the conditions in which they formed. Thus we enter the weird realm of a rare group of meteorites -- the Enstatite chondrites. On the evening of June 9th at 11:05 PM MST, people living in Alberta, Canada witnessed a fireball moving swiftly across the sky from the Northwest. Detonations and concussions were reported as the fireball proceeded through the atmosphere to extinction. Moments later, the largest known enstatite chondrite arrived on Earth. Five days later in the town of Abee, 90 km north of Edmonton, Harry Buryn, while tending his new wheat field, found a hole 2ft. to 3ft. in diameter, six feet deep, inclined at an angle of 25.5 degrees to the vertical. At the bottom, sat a single 107 kg blackened, fusion-crusted stony mass. Eugene Poitevin, Chief of the Mineral Division and Collection Curator of the Geological Survey of Canada (GSC), determined it to be an enstatite chondrite -- a rare type of stone meteorite. Poitevin offered $1,062 (Canadian) or $10 per kg to Buryn and Abee, the third largest meteorite to be found in Canada, was acquired by the GSC on December 9, 1952. Based upon bulk compositional differences and what appear to be separate metamorphic differences, enstatite chondrites are separated into two classes: high-iron (EH) and low-iron (EL) (Keil, 1968) similar to the H and L designations of ordinary chondrites. But they are much different from H and L chondrites and all other meteorites -- they lack an oxygen abundance. In fact, so little oxygen is present that virtually all of the iron occurs as metal or as sulfide. These highly reduced rocks, consisting of a mineral assemblage dominated by the magnesium silicate mineral enstatite (MgSiO3), represent less than 2% of all known meteorites. The lack of oxygen, during their formation has made them the host for some weird, rare, oxygen depleted minerals, among them - sinoite (Si2N2O), perryite (Ni,Fe)5(Si,P)2, and djerfisherite (K3CuFel2SI4). When they formed 4.49 billion years ago, it was within an unknown oxygen-poor area of the solar nebula. Abee is an impact-melt breccia, EH chondrite. Its internal structure is a myriad of granulated metal-rimmed, varying-sized clasts embedded in a dark gray, fine-grained groundmass. "How?" and "what?" are the first two words that come to mind when one sees this meteorite. Since its initial description (Dawson, 1960) Abee has been the subject of more than 31 studies focusing on brecciation, diamonds reportedly of solar nebula origin (Russell et al., 1992), the oxygen depleted environment where it formed (Clayton et al., 1984) and many parent body studies. The latest (Rubin and Scott, 1996) is an exhaustive treatment of Abee's mineralogy and its implications. Rubin and Scott argue effectively for two distinct impact events with an intervening period of brecciation through meteoroid bombardment to explain the diamonds and partially melted clasts embedded within the matrix of fine-grained but similar material. To date, all studies have been conducted on small pieces originally sectioned from one end of the meteorite around 1960. Recently, however, another section -- the oriented end piece -- has been made available for study. The surface dimensions in both axes are 38 cm x 34 cm offering approximately 1,020 cm2 for a rare "macro" view of the interior that differs in some ways from other reported sections. The most obvious structure in this end piece is a huge clast 22 cm x 14 cm covering approximately one-third of the surface. This clast and three others in this specimen continues through the meteorite to the exterior surface. The fusion crust is eroded around these clasts with the result being a clastic outline on the crusted exterior. The breccia displays a distribution of irregular shaped clasts in a 50/50% volume representation of l mm to 4 cm clasts and eight larger 6 cm to 22 cm clasts. This is different from the irregularly shaped 1 mm to 6 cm size clasts reported by Rubin and Scott (1996) and Wacker (1982). These two clastic groups, found in this end piece 21 cm from sections previously studied, indicate that Abee may be a transitional rock displaying the beginning of a bimodal distribution of fragments. 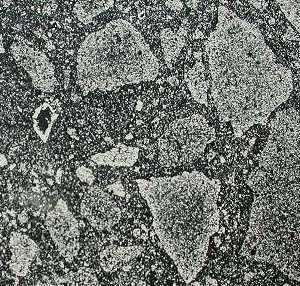 Chondrules are minimal within the clasts supporting the observations of Rubin and Keil (1983). Two clasts, 5.5 cm x 4 cm and 5 cm x 3.5 cm, differ from previous reports. Both have a higher abundance of chondrules in comparison to the other clasts and may be similar to those reported in Adhi-Kot (Rubin, 1983). All clasts are outlined with coarse-grained, rind-like metal rims of the nature reported by Dawson (1960). Everything about this meteorite is interesting. As an enstatite chondrite, it represents one of the rarest known groups of meteorites. Abee's brecciated structure is a vivid representation of a violent and complex sequence of impacts -- large angular clasts of partly melted material with igneous oldhamite-rich dark inclusions, all embedded within a previously melted, but similar, groundmass. The mineralogy of enstatite meteorites is lacking the oxygen abundance found in all other meteorites; how and where did they form? It must have been in an oxygen-poor area of the nebula. Can a core-to-surface model of the E parent body be constructed? What if it was ... Mercury? As the solar nebula cooled, specific minerals would have formed relative to the pressure and temperature of the nebula. The cooling gas would condense nickel and iron before any silicates. In a discoid-shaped nebula the gas pressure would be highest at the center decreasing outward to the edge. High pressure and temperature would have prevailed from Mercury's orbit inward and metal may have condensed long before the silicates. Metal at 1000 C is "sticky". The core of Mercury may have accreted from these metal grains well before any condensation of stony silicates and perhaps formed core-first through gravitational influence. As the nebula cooled, the core could have been covered in layers with stony, chondritic material. Currently, Mercury represents a special case in our solar system -- its high density iron to silicate ratio (core/mantle) is about twice that of the other terrestrial planets. A current hypotheses to explain this is collisional removal of the mantle from impact during the closing stages of planetary accretion. In the early solar system the orbit of Mercury inward would have been a high energy environment. Comets or other objects in eccentric orbits around the Sun accelerate as they approach. Impacts on the mercurian surface, then and now, occur with great energy. A cometary object impacting Mercury, prior to or during its eventual complete differentiation from heat might have blasted pieces of both the outer chondritic layer and core into eventual parking or holding orbits within the asteroid belt that later crossed Earth's path. Improbable? Perhaps. Curiously, the study of light reflected from Mercury's surface indicates that it is iron-rich and oxygen-poor -- characteristics shared with E chondrites. But, if Abee represents a piece of early Mercury where has it been for over four billion years? Computer models of Earth-crossing asteroids predict an impact with a planet or another asteroid within 100 My and even less for objects with Mercury-crossing orbits (Gladman et al., 1996). Breccias are from the surface of things. Is Abee a piece of the primordial exterior surface of Mercury prior to differentiation? Or, is its home an undifferentiated asteroid-sized body in Mercury's vicinity? Love and Keil (1995) studied the impact launch and orbital dynamics of possible mercurian meteorites. Interestingly, they indicated a 10% chance that a mercurian rock could exist in current meteorite collections. Current studies seem to present difficulties for other than an interesting connection between enstatites, the inner solar system, and Mercury. Is the connection provable or simply an anomalous curiosity? I don't know. But absence of proof is not proof of absence. We learned that from the Albion iron. I am indebted to Carl Francis, Richard Herd, Timothy Grove and Richard Binzel for their valuable discussions; to Alan Rubin for direction and helpful criticism; and to Joel Schiff and Stan Love for their thoughtful review. 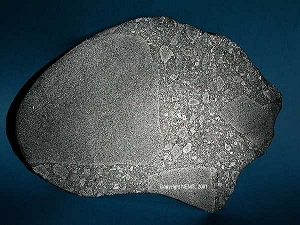 The Author recognizes the controversial nature of possible Mercurian meteorites and recognizes the arguments for and against a connection between E chondrites, the inner solar system., and Mercury. Clayton, R.N., Mayeda, T.K., and Rubin, A.E., Oxygen isotopic compositions of enstatite chondrites and aubrites, Proc. Lunar Planet. Sci. Conf. 15th, C245-C249. 1984. Dawson, K.R., Maxwell, J.A., Parsons, D.E., A description of the meteorite which fell near Abee, Alberta, Canada, Geochim. Cosmochim. Acta 21., 127-144, 1960. Gladman, B.J., Burns, J.A., Duncan, M., Lee, P., Levison, H.F., The exchange of impact ejecta between terrestrial planets, SCIENCE 271, 1387-1392, 1996. Keil, K., A Mineralogical and chemical relationships among enstatite chondrites, J. Geophys. Res. 73, 6945-6976, 1968. Love, S. G., Keil, K., Recognizing Mercurcian Meteorites, Meteoritics 30, 269-278, 1995. Rubin, A.E., Keil, K., Mineralogy and Petrology of the Abee enstatite chondrite breccia and its dark inclusions, Earth Planet. Sci. Lett. 62, 118-131, 1983. Russell, S.S., Pillinger, C.T., Arden, J.W., Lee, M.R., and Ott, U., A new type of meteoritic diamond in the enstatite chondrite Abee, Science 256, 206-209, 1992. Wasson, J.T., The building stones of the planets. In Mercury, Vilas, Chapman and Matthews Eds., University of Arizona Press, 1988.